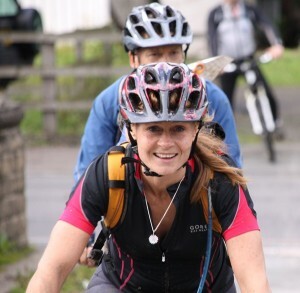 Every year we organise and run the Mary Towneley Loop Challenge to raise funds for the Team; it’s not a race, and the only person you compete with is yourself. After 2010’s event being one of the wettest seen, it was a boost to morale to have the sunshine out for most of Sunday 18 September 2011. However recent rainfall did leave the course muddy and wet – as our man above shows. An impressive 153 riders turned up to take on 47 miles of tracks, packhorse trails, and old quarry roads. Add in 2,500 metres of climb and descent, and you’ll realise why the Mary Townley Challenge is a toughy. The lead rider came home in 4 hours 20 minutes (show off!) but the bulk of the entrants were in after 8 hours. That gives you some idea of what you’re up against on this event – it’s a true MTB marathon. If you’ve thought of doing the Loop, it is a long ride and there’s very little refreshment available on the route itself; it’s a massive test of both bike and rider as well. Possibly this is why the event is popular – with checkpoints on the route offering both safety and refreshments, that’s one less thing to carry. Knowing you’ll get a lift back to the start if you or your bike breakdown must help too. 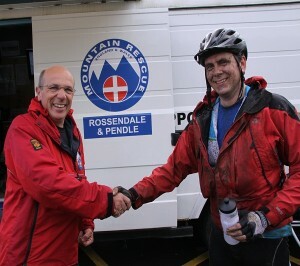 Thanks goes firstly to all the entrants – we raised over £2,500 that will keep our wheels turning well into 2012. We need about £22,000 per annum to stay operational and the only place we can get it is from charitable donations like yours. Wait till you get home, you mucky pup! Thankyou to Tia and Linda from United Utilities who made sure we could pass across their land. The sports physios I know were very welcome and made sure some entrants could walk back to their cars instead of being carried. Thanks ladies! 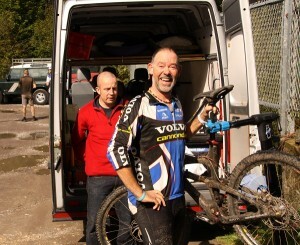 Another massive help who deserves a massive thankyou is Craig from RideOn in Rawtenstall (http://www.rideon.co.uk/ ) His van full of spares kept a good few of you in the race (brake pads especially). It’s good to see an independent bike shop flourishing in our area – I am sure he’ll appreciate your custom again. Craig gets 40 winks while another happy customer rides off into the sunset. Now I reckon all bikers like a nice bit of cake, and some of the nicest cake I tried was a chocolately marble type affair that was kindly made for us by the owner of http://www.marmaladesbandb.co.uk/. She normally rides the event, but this year it was just her husband riding. 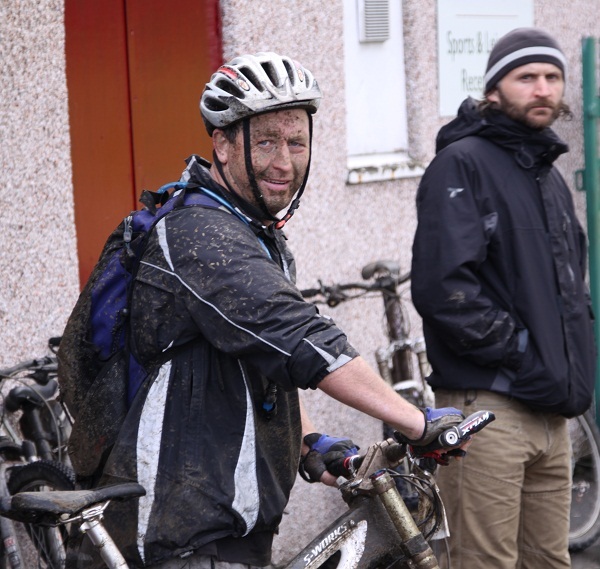 Check out their facilities – it must be the area’s most MTB friendly B and B and close to Lee Mill Quarry. Top support – many thanks! The Rangers Service were a massive help, keeping an eye on road crossings and bringing the odd stray back to the fold. It was also fantastic to once again have the use of Fearns High school as a base for the event – we couldn’t manage without you guys. 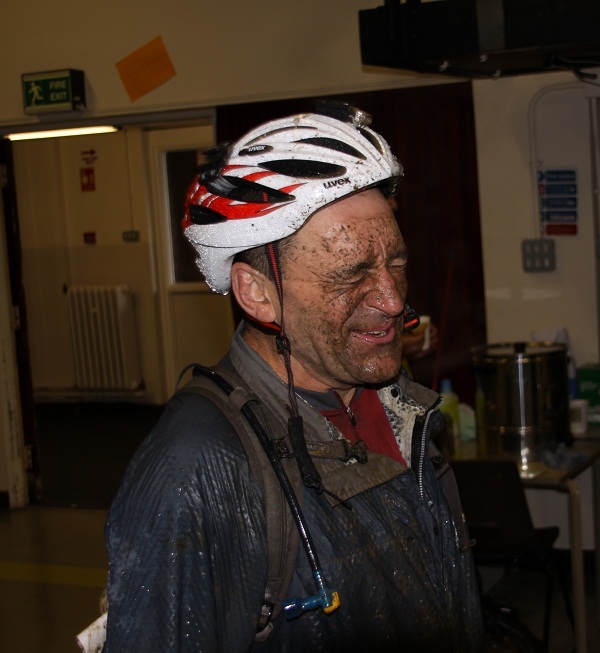 A personal apology that I didn’t see the the state of the showers until it was too late – it won’t happen again. Three lucky riders (Phil Dickinson, Bob Whitmore, and James Stewart) won a year’s subscription to Singletrack magazine – you can sample their wares here: http://www.singletrackworld.com/. Here’s a lucky winner getting his prize in a free presentation special edition bottle – there’s no end to the freebies is there? See you all (plus your friends and lots of other new comers) in 2012! Dial 999 and ask for the Police and then request Mountain Rescue. Be ready to give details of the incident including the number of casualties, any injuries, your location and telephone number. Then stay near the telephone unless otherwise instructed. If your call was via mobile, do not switch off. Help fund RPMRT - 100% of funds raised go back into the teams development and equipment. Copyright RPMRT 2018. Registered Charity Number 508209. All Rights Reserved.